Halloween returns and with it the scariest Trick Or Treaters ever seen! Living Dead Dolls series 18 features five terrifying new dolls who ask for treats but bring with them nothing but tricks! 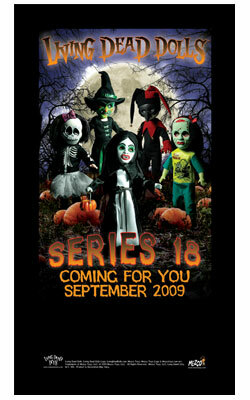 This exclusive banner shows the world that Living Dead Dolls areavailable at your retail location. Printed on durable 10 oz. vinyl, this limited-edition banner measures an eye catching 18 inches wide by 36 inches tall (approximate). Only 200 are being made, so don’t miss out on this exclusive opportunity! The bottom portion of the banner will feature the previously unseen faces of the series 18 dolls without their masks. LDD fans and retailers can order the banner at: MezcoToyz.com while supplies last.